“The poor man dreams of crumbs,” says a Greek proverb. Now what does that mean? Well, it means that what the poor man has on his mind (food, in this case), is what he sees in his dreams. In other words, whatever we’ve got on our minds, whatever is bothering us in our subconscious, might come out as a dream. As Karen Horney, the internationally famous psychiatrist, says in her book Self-Analysis, dreams are the voice of our aspirations. The devil sows all sorts of thoughts in our brains. The Evil One doesn’t confine himself to this task only when we’re awake, but continues when we’re asleep. So it’s perfectly possible for us to see things in our dreams that actually come from our enemy. God, too, can speak to people through dreams. There are plenty of examples of this in the Scriptures, such as the dreams of the Pharaoh that Joseph interpreted (Gen. 41). Therefore: Diabolical dreams terrify us and make us despair. Divine dreams (the only ones which are valid) show us Hell and the Judgment. We awake from them concerned, positively concerned, about the salvation of our souls. Human dreams neither terrify us, nor cause us to despair, nor bring us to repentance and the salvation of our souls. In the old days superstitions were rife, especially in country districts. Now that life in general has changed so much, many of these superstitions are dying out. Some are still going the rounds, though, and it’s with them that we’ll deal now. Everybody hopes that the New Year will get off to a good start and continue in the same vein. Indeed, we pray for this. Some people, however, take a superstitious view and resort to “charms”. They bring in the New Year by eating, drinking and having a good time. They’d think it bad luck not to welcome the New Year with feasting and revelry. They’d be worried that the whole year would be spoiled. They play cards or gamble for the same reason: if they’re lucky at New Year, the whole year will be lucky. They go to church on New Year’s day for luck (not out of due piety). They even take communion for luck (not “for the remission of sins and life everlasting”). However, a New Year enters our lives every moment. Every minute that we live is also a new year. So what happens at New Year also happens every minute of the day. Every moment is New Year’s day. If you’re on your way to work first thing in the morning and you happen to meet a cripple, a blind person - or, in Greece, a priest! - you take it as a bad sign. In fact, the “bad sign” isn’t the meeting at all. It’s your own faith and superstitiousness. It is a sure sign that you’re deeply deluded. St John Chrysostom says that the way your day goes doesn’t depend on whom you meet first thing in the morning. Your day goes badly when you live in sin. So when you leave your house, beware of an encounter with sin. What matters here is what the Church says, and the Church doesn’t forbid it. “Is it all right” they ask, “for the same family to have a memorial service and a wedding in the same month (or six months)?” The same thing applies here: the Church doesn’t forbid it. There are all sorts of superstitions regarding women after childbirth. For example: a) it doesn’t do for new mothers to travel before the fortieth day, b) It doesn’t do for new mothers to go out at night, and so on. The only thing the Church lays down is that the woman is not permitted to enter a church, nor, of course, to take communion, before the service on the fortieth day. Some of the superstitions associated with funerals are: a) Some people thinks it is a bad sign to look back when a dead person is being brought out of a house, b) Some will break an object, often a plate, to drive away bad luck (as if death would be afraid of the odd broken plate! ), c) Others will cut themselves off from the Church for a year! - again, as if cutting yourself off from the Church for a year is going to avert evil. This means that the evil eye is NOT, for example, an ordinary headache, an ordinary dizzy spell or whatever. It’s definitely something EXTRAORDINARY, something dreadful, something unbearable, something SATANIC. Eyewitnesses report that a villager had a fine horse. Some envious person looking at it, said, “What a fine horse,” and the animal dropped dead on the spot. That’s obviously an action of the devil. Which People Have “the Eye”? The story above reveals that the evil eye belongs to those who have evil within them: “Dispel every poison of corrupt and envious people.” (From the Prayer Against the Evil Eye). In older times, it was common for people to spit if they admired, for example, a beautiful child. In this way, they would symbolically get rid of the “poison”, i.e., any trace of envy that might do the child harm. Whom does the “Eye” affect? Obviously, since the evil eye is an action of the devil, it can affect anyone who’s not equipped with the weapons to combat the devil and his machinations, which are prayer, fasting, confession and Holy Communion. This is why: a) Saints aren’t affected, b) Priests aren’t affected either (because of the priesthood), c) Neither are those affected who take part in the sacramental life of the Church. Given that the evil eye is an action of the devil, a special prayer is required to exorcise him. The Orthodox Church has adopted a special prayer against the evil eye which exorcises the devil. This prayer is to be read only by a priest. Suppose you’ve had the evil eye put on you, and instead of going to a priest you go to a woman who “specializes” in such cases. If you do this both you and the woman are committing a sin. You are sinning because you are scorning God’s appointed servant (the priest) and going knocking at the door of a stranger, and the woman is usurping the position of the priest. To be more precise: Lay persons, because they aren’t ordained, don’t have the right to make the sign of the Cross over other people in a sacramental way. Why don’t you just make the sign of the Cross over yourself? What’s so holy about these people’s hands? Since they’re not priests, they obviously can’t perform a sacrament, such as, for example, Holy Unction. Yet these women dare to do just that. They “sanctify” a bit of oil themselves and then make the sign of the Cross with it! Have you ever wondered why they don’t use oil from an icon-lamp? In their rituals, they mix up words from the Church and from elsewhere (i.e. the devil). Do the prayers of the Church really need fortifying by those of the devil? 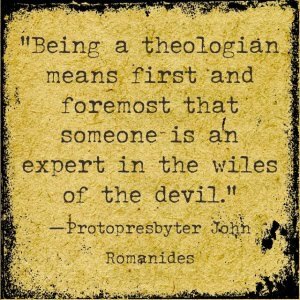 In the end, which words will be effective, those of the Church or those of the devil? It is likely that the Lord will pay any heed to defiled prayers? And don’t say: “But just as soon as the woman exorcised me, I felt well again” because it could be psychological or it might have been the devil who has made you well. On 2/3/1998, a certain gentleman from Patras, Greece, told me about something that had happened to him about 15 years earlier. In brief: From the age of 14, his family would take him along to be “exorcised” every so often. But this was just the handle the devil wanted. He himself began to have the power of the eye. Something bad happened to anyone he admired. He might, for example, look at a woman walking down the street and at once she’d stumble or twist her ankle. After this unforgettable experience, the man lost no time in going straight to confession. He regained his peace of soul, and what’s more, he stopped putting the evil eye on people.